Down to the Bone is the first novel I have read in the Quantum Gravity series and indeed the first by Justina Robson, as such this review should be seen from that perspective; how a novice of the series will fare jumping in at the fifth and final volume. The idea behind Quantum Gravity is that our reality mixes with other dimensions which are home to demons, elementals and even the fae but set at some point in the future, with a science fiction edge. Lila Black is the heroine, a strong, quirky human who is edged with little mannerisms and foiables that add a sense of realism and encourage the reader to bond and relate to the protagonist. In theory there shouldn't be any reason why elves and daemons cannot exist within a high tech world rather than the more traditional medieval setting however in practice this mixture of fantasy and science fiction elements can be very difficult to achieve. When done well it does become very powerful (Star Wars being the perfect example) and I am glad to say that here this vision is spot on, providing a rich, vibrant and luscious world and back drop for the story. It is a unique combination and one that incorporates these usually disaparate elements while still managing to instill a high tech feeling and make use of a number of sci-fi tropes. 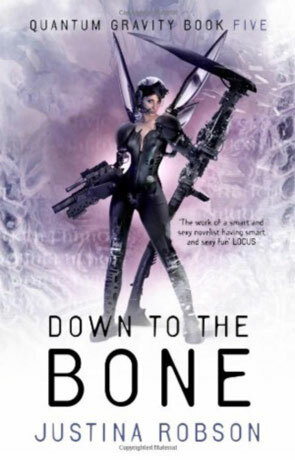 Down to the Bone follows our intrepid adventurer Lila Black as she faces her greatest challenge yet, to take herself, dead lover and the AI embedded in her cranium to death's own realm. This protagonist is a strong female role that manages to extrude a quirky, fun and lively quality while at the same time managing to maintain a calmly dangerous, complex and ever so slightly flawed personality. The other main characters of Zal and Teazle are just as rich and the story essentially follows the path of all three as they each confront their own problems. The pace is pretty hectic to begin with and continues to accelerate as it moves through the novel, there isn't a huge amount of back story or exposition, more just hints and references to past events which did mean as a novel to the Quantum Gravity universe it took me a little while to adjust and I have no doubt that those who have read the previous novels will get more out of their previously invested time. There is a fantastically stylish voice projected from the pages, a wonderfully rich future tech vibe and a youthful exuberance that is pretty much irresistible. While I may have been a little phased at the beginning - feeling a little like the person at a party who doesn't know any of the other guests - once I started to make friends I found myself swept away in sea of action, surprises, twists and turns, bluffs, double-bluffs and a highly rewarding finale. Down to the Bone is a vibrant, sassy, energetic and wonderfully well written roller coaster of a novel. Written on 24th October 2011 by Ant.